The course of some heart disease can end with acute coronary syndrome, when, on the background of, for example, an attack of unstable angina, the patient fails. The development of such a pathology requires immediate medical intervention, since at any moment a person may perish. 1 What is acute coronary syndrome? Acute coronary syndrome (OCD) is a clinical definition of the acute period of coronary heart disease, during which develops symptoms characteristic of myocardial infarction, coronary artery disease, unstable angina pectoris. In medical practice, this term is often used during a preliminary diagnosis, when the characteristics of the disease are not fully elucidated. Acute coronary syndrome develops very rapidly, so in just a few minutes, the patient can stop heart activity.With this disease around the world horrifying statistics: in the United States each year with a similar diagnosis, about 1 million people are hospitalized, more than 800,000 in Europe. The characteristic clinic of the disease allows you to quickly diagnose and provide first medical care, but before the arrival of doctors, patients often have to stay alone with the illness. In such cases, it's important to know what actions will help you to wait for the arrival of skilled professionals. During the development of coronary heart disease, there are periods of exacerbation and remission, when the course of the disease is more or less stable. Under the influence of predisposing factors, coronary heart disease becomes aggravated, due to which a milder form - unstable angina (NSC) or severe - myocardial infarction (MI) develops. IM with rising segment ST.
MI without rising segment ST. The pathophysiological process of developing unstable angina and myocardial infarction is the same, although clinically these diseases manifest themselves in different ways. Unstable angina - acute cardiac muscle ischemia, which is not so pronounced to cause a heart attack. The main difference between angina and heart attack is the absence of ECG signs of myocardial necrosis (Q and ST elevation) and specific biomarkers in the blood in sufficient quantities to diagnose the MI. Sometimes there is a transition from one pathological state, usually to the NSA, to another - the MI, and the time of this transition is very individual, since much depends on the predisposing factors contributing to the onset of the disease. Acute coronary syndrome is any group of clinical signs or symptoms that make it possible to suspect acute myocardial infarction (MI) or unstable angina (NC) (National Clinical Recommendations, Acute Coronary Syndrome, 2008). Why should you know about acute coronary syndrome? The frequency of acute coronary syndrome has increased. It is important to promote the implementation of a new strategy for assistance to AMI patients. The development of the disease should be timely response. Primary and secondary prevention is needed. With extensive MI of the anterior wall of the left ventricle, mortality is 25.5%. With a large MI of the anterior wall, mortality reaches 12.5%. In the anterolateral or anterior ventricular MI, mortality is more than 10%. At the MI of the posterior wall and lower limb infarction mortality is more than 8%. A small lower MI causes death in 7% of cases. The development of acute coronary syndrome is directly associated with impaired circulation in the coronary artery (coronary) arteries. These formations refer to their own heart vessels, which feed on nutrients and oxygen to the heart muscle. Right coronary artery (Arteria coronaria dextra). It enters the blood to the right ventricle, the posterior wall of the organ and partly the interventricular septum. In thrombosis of her or related small branches, blood circulation in the corresponding departments of the heart is disturbed. Left coronary artery (Arteria coronaria sinistra). Blood supply to the anterior wall and upper heart, most of the interventricular septum and, of course, the left half of the myocardium. If a circulatory disorder occurs in the system of this artery, serious MI attacks occur or extensive MIs develop. Constriction of the blood vessel. It mainly develops due to atherosclerosis, which is characterized by the formation of atherosclerotic plaques on the inner wall of the vessels. In this process, low and very low density lipoproteins that carry cholesterol are directly involved. With a significant amount of them in the blood, they settle down on the walls of the vessels, which in turn react to such an "invasion" by an inflammatory reaction. The thrombus begins to develop at the site of the defeat, which is able to tear off and clog the lumen of the vessel. Also, a strong presentation of an atherosclerotic plaque in the lumen of the vessel leads to a disturbance of blood flow. Therefore, if atherosclerosis affects the coronary arteries, then with time develops coronary artery disease, and in severe cases, acute coronary syndrome. Oxygen fasting. In a normal state during a physical load in a person the vessels expand, which allows to ensure a full-fledged flow of oxygen and nutrients to organs, including the heart. If the patient has atherosclerosis, then the vessels can not freely expand. This leads to a failure of the compensatory reaction and acute oxygen starvation (hypoxia). Such heart muscle is extremely hard to bear, therefore developing an IUD or acute coronary syndrome. Insufficient amount of oxygen in the blood. It is observed in a number of diseases, such as anemia, etc. If the blood circulation in the coronary arteries is furthered in the body, then the risk of acute coronary syndrome increases sharply. Today, almost 95% of patients with coronary artery bypass grafts or coronary artery disease suffer from coronary artery disease with atherosclerosis, therefore, the mechanism of development of this disease is closely related to the further occurrence of coronary diseases. Despite many well-known aspects of the process of formation of atherosclerosis, and, with it, IBS and OCD, there is still no single theory for the development of this disease. However, with the help of statistics and experiments, it was possible to determine the predisposing factors contributing to the emergence of coronary diseases. Dyslipidemia. Under this term is meant a change in the normal ratio between different types of lipids. At present, critical remarks relate to indicators such as total cholesterol and LDL cholesterol. With an increase in these parameters in the blood, the risk of developing acute coronary syndrome increases directly proportionally. For example, with a total cholesterol of more than 6.2 mmol / L and LDL greater than 4.9 mmol / l, there is a very high probability of coronary artery disease. Smoking This harmful habit increases the risk of developing OCs several times, as the substances released in the course of smoking contribute to increased blood coagulation, increased blood pressure and vascular endothelial damage. Hypertension. In most cases, OCD develops when the systolic pressure reaches 140 mm Hg. Art. and more In such conditions, the vessels are more often damaged, which is why they are advised to reduce the blood pressure in time with special medications. Increased body weight. This risk factor often contributes to the development of hypertension, dyslipidaemia, diabetes mellitus. In obesity, other disorders of metabolic processes are often observed, which also increases the risk of acute coronary syndrome. Hypodynamia"Sitting" is often preceded by obesity, arterial hypertension, and increased blood coagulation, and this risk factor may eventually lead to OCD. Especially since studies show that moderately mobile people have a healthier heart muscle. AlcoholismAgainst the background of chronic alcohol abuse, various liver diseases often develop, which in turn leads to dyslipidemia and, in distant cases, to acute coronary syndrome. Diabetes mellitus This disease is characterized by malignant flow, when many metabolic processes, especially carbohydrates, are violated. There is an increase in the amount of cholesterol and LDL, which, compared with the rest of the patients, occurs 3 times more often. Therefore, in diabetes, the risk of developing OCD also increases dramatically. Heredity There are such forms of dyslipidemia, which are transmitted by heredity. In their presence, it is also possible to develop atherosclerosis and other pathologies associated with vascular diseases, including OCD. Therefore, in determining such diseases in the family, the probability of occurrence of coronary pathologies increases significantly. Frequent stresses. 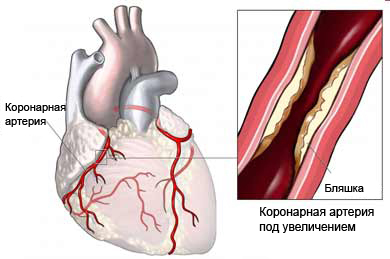 Launch pathological reaction in the body, at the end of which often there is an acute coronary syndrome. Increased blood coagulability. A similar factor in the development of atherosclerosis has not yet been studied, but according to preliminary data, blood coagulation factors, together with platelets, can play an important role in the formation of an atherosclerotic plaque. In some cases, acute coronary syndrome develops against those diseases that are not associated with ischemic heart disease. Then talk about secondary predisposing factors or non-arteriosclerotic causes. Their background often develops myocardial infarction, and therefore their appearance is considered more dangerous. The development of illness in such cases is difficult to predict, and in part it is simply impossible. Anomalies of the coronary arteries. Embolism of the coronary arteries. Thus, acute coronary syndrome is caused by many causes, both primary damage of coronary arteries and their secondary changes. In such cases, various clinical forms develop, which by their current, method of diagnosis and treatment undergo similar characteristics, therefore they are united in such a collective concept as OCS. Many risk factors for OCs are similar to those in CHD. Myocardial infarction without ST segment elevation. Myocardial infarction with the rise of segment ST. The definition of the variety is based on clinical manifestations and ECG-symptoms. In medical practice it is known as "chest frog". Unpredictable in its flow, therefore, unlike the stable form, unstable angina is classified as acute coronary syndrome. In some cases it can go into myocardial infarction, so it is considered a dangerous disease. Increasing NA. It is dangerous because of its rapid progress, as the patient becomes worse with every attack. Sometimes drugs cease to help and then you need to either increase the dose or replace it with another drug. For the first time emerged NA. Painful sensations characteristic for pathology appear for the first time not more than a month ago. Most often, the progression of the disease is not so pronounced as in the first case. Due to the occurrence of complications with the formulation of the prognostic conclusion and the determination of the true severity of the patient's condition, this form of HC refers to the ACS. Early postinfarction emergency. This form involves pain sensations that appeared within thirty days after the transferred MI. The danger of the condition is that the pain may indicate poor coronary circulation, which increases the risk of developing a recurrent heart attack. NA after angioplasty. In some cases, after surgery, associated with correction of part of the coronary artery, pain is again determined. Most commonly, this happens during the six months after angioplasty. NA after aortic coronary bypass. The operation is based on the creation of a bypass path instead of an existing damaged vessel. This is done by laying a new vessel. In some cases, for various reasons, after the CKD, six months later there are again angina attacks, indicating the progression of the disease. Stenocardia Printsmetala. Also known under such name as variant stenocardia. It manifests itself in severe pain and frequent attacks, the time of occurrence of which often occurs in the morning and evening. When determining this form of acute coronary syndrome, it is not a question of the presence or absence of damage to the myocardium. In this variant of the disease, the classic ECG signs are not determined, but at the same time the patient presents the typical complaints of the MI. In addition, specific blood parameters rise. In most cases, the absence of ECG signs of myocardial infarction indicates a small area of the lesion, although sometimes the ST segment does not rise immediately, but after some time after the attack. The ST segment often rises when angina pectoris, so it's difficult to judge the process on an ECG alone. Most often, this diagnosis is given by ambulance physicians or on admission to the hospital, which makes it possible to treat the patient to a risk group for acute coronary syndrome. Further research allows us to establish a more precise form of the disease. The classic development of heart muscle damage, which is necessarily complemented by characteristic clinical signs. ST segment elevation is associated with pathological activity of the myocardium.Cardiac muscle ischemia provokes a disturbance in the balance between the amount of potassium inside and outside the cardiomyocytes, resulting in impulses that increase isoline. Acute coronary syndrome is manifested by characteristic symptoms, the combination of which allows experienced doctors to quickly pre-diagnose. Appear against a lack of oxygen supply to cardiomyocytes, also known as anginal pains. May be the only manifestation of the disease. Possess the characteristic signs that allow to suspect the development of acute coronary syndrome. Paroxysmal flow. Often linked to a previous pain by physical activity or emotional stress. In some cases, especially with angina, it develops at night or in the morning and then suggest a more unfavorable prognosis. Description of pain sensations. In patients, pain is more often characterized as compression, cutting, or peeling. In some cases, the patient seems to be grabbing for the left breast, which indicates the location of the pain. Intensity. In the main, pain is extremely pronounced, it's so that patients try not to move and not even breathe in order not to intensify it. Because of pain, patients are extremely excited, it is difficult for them to find a comfortable position in which painful sensations are reduced. Duration Pain in myocardial infarction is prolonged, can last up to an hour or more. There are no "breaks", so all this brings the patient the most severe suffering. With angina, the pain may last up to 10 minutes and repeat itself for a while, which also does not allow the patient to calm down. Localization. The typical location of the pain is to the left of the sternum. It can also be determined in the middle of the chest. But the most characteristic sign is the irradiation of pain when it spreads to the left arm, the lower jaw and even the back. Sometimes, with large-centered waist-MI, pain relief is lowered down the abdomen, in the inguinal region. The pain is practically not blocked by nitroglycerin, which distinguishes the ACS from stable angina pectoris. In some cases, the use of narcotic analgesics is required in order to relieve such painful sensations. The appearance of cold sticky sweat is due to the high level of pain experienced by the patient. In this way, the autonomic nervous system reacts to acute pain, but it also causes severe skin fluttering. A little later, the pallor is combined with the cyanotic shade of the skin, which is explained by necrosis of the part of the heart muscle, on the background of which develops arrhythmia and, as a consequence, circulatory disorder. The psychic of a person responsive to severe pain, difficulty in breathing and interruption in the work of the heart. It may also be a few seconds for cardiac activity to stop. All this causes the fear of death, in severe cases - a panic attack. During an attack of unstable angina, and even more so in myocardial infarction, severe painful sensation, arrhythmias, pulmonary conduction impairment lead to a disorder of the respiration process. Large-centered MIs are often accompanied by abnormal hemodynamics, which also contributes to shortness of breath. It is particularly difficult to breathe when blood stays in a small circle of blood circulation. Also known as syncope, which is associated with short-term cerebrovascular disorder. At the NA, there are practically no faintings. Their development is mainly due to extensive infarctions, when blood circulation is severely disturbed. Period of occurrence of syncope - right after a heart attack. If they appear in a more distant time, then this indicates an atypical course of the disease (cerebral form). A threatening sign of stagnation in a small circle of blood circulation. Most often it manifests itself as dry, without sputum. Frequently accompanied by shortness of breath. In rare cases, atypical forms of the disease develop: abdominal, cerebral, collaptoid, edema, painless and arrhythmic. Signs of the blockade of the hip leg of Guillaume. Pathological tooth Q appears (indicates transmural MI). V1-V6, I, aVL combined with signs of blockade of the leg of the Gissa bundle - extensive left ventricular myocardial infarction of the anterior wall. V1-V6, I, aVL without blockade is a large front-end IM. V1-V4 or I, aVL and V5-V6 are anterior ventricular or anterolateral IM. II, III, aVF - large lower myocardial infarction. II, III, aVF in combination with V1, V3r, V4r - right ventricular lesion. II, III, aVF in combination with V5-V6 - lower limb MI. In III, III, aVF leads, the isolated rise of the ST segment is a small lower im. Increase the size of the heart chamber. Such changes correspond to the localization of the defeat, that is, at the IM of the left ventricle, the chamber of this department of the heart is stretched. Valve operation varies. In the IM of the left ventricle, the activity of the mitral valve is violated, and in the case of the right ventricle MI - tricuspid. This is due to the stretching of the heart chamber (and, with it, the valve ring) against the background of a contraction of the affected myocardium. Swirling blood flow. The myocardium begins to decrease unevenly, because of which the hemodynamics are violated. Blood of the heart wall. This symptom is determined by a large MI, especially the left ventricle. Swelling is associated with an increase in internal pressure. Extension of the lower hollow vein. Symptom is characteristic for the right ventricular membrane, it develops due to the weakening of the activity of the right heart and the stagnation of blood in the venous system. First of all, the blood accumulates in the lower genital vein, so its extension indicates a problem area. The biomarkers , whose increase in concentration indicates myocardial necrosis, must be determined. In the first 3-4 hours, the content of troponin-T, troponin-I, myoglobin, creatine phosphokinase, and KF isoform increases. Further, the amount of aspartate aminotransferase, lactate dehydrogenase and its isoform increases, KFK-MB. These markers can not be determined at once, just two or three in combination with the clinic, to make a precise diagnosis. Scintigraphy of the myocardium - is assigned in the case of a difficult diagnosis of localization of the MI. Conducted using radionuclide substances. Coronary angiography - a substance is introduced into the coronary arteries through an intravenous catheter, after which photographs are made, on which narrowed and congested vessels are visible. Magnetic resonance imaging - allows you to identify even small areas of myocardial mortality. Pulse oximetry - allows you to specify the level of oxygen in the blood, after which, if necessary, an oxygen therapy is prescribed. Laboratory studies in the form of a general blood test, biochemical analysis of blood, coagulogram allow to conduct a general diagnosis of the body. In the development of acute coronary syndrome, the risk of death in the absence of medical care is almost 50%. Therefore, all patients with suspicion of ACS or confirmation of such a diagnosis are subject to hospitalization. Used to prevent oxygen starvation of the myocardium, additional means are used to eliminate the symptoms, especially severe pain. To date, many treatments have been developed for patients with ACS, the decision on the choice of therapy is taken by the attending physician, who pre-examines the patient. Nitroglycerin - by improving the blood supply of the heart muscle and reducing the consumption of oxygen by its cells, the process of death of cardiomyocytes is slowing down. They give a tongue with the transition to intravenous drip administration. Isosorbide nitrate - contributes to the flow of blood to the heart muscle due to the expansion of coronary vessels. It is administered intravenously. Oxygen - used as inhalations, is prescribed for the determination of oxygen in the blood at 90% and below. Aspirin acts as a thrombolytic, thus preventing the formation of blood clots.тUsed in tablets. Clopidogrel - prevents the appearance of blood clots. Used in tablets. Ticlopidine reduces the viscosity of the blood, prevents platelet gluing. Used in tablets. At high blood pressure and tachycardia, beta-blockers are prescribed. Depending on the patient's tolerability, propranolol, atenolol, metoprolol, and esmolol are used. Do not prescribe drugs from the BAB group in the presence of a patient with chronic obstructive pulmonary disease. For pain relief, analgesics such as morphine, fentanyl, droperidol, promedol, diazepam are used. The risk factors for atherosclerosis should be eliminated or minimized.In order to achieve this goal, you must abandon bad habits (alcohol and smoking). Other causes of OC should also be eliminated. Body mass should be under control. With its excess, it is necessary to use the services of a dietician, which will help to normalize the Kettla index. Anti-arteriosclerotic nutrition. 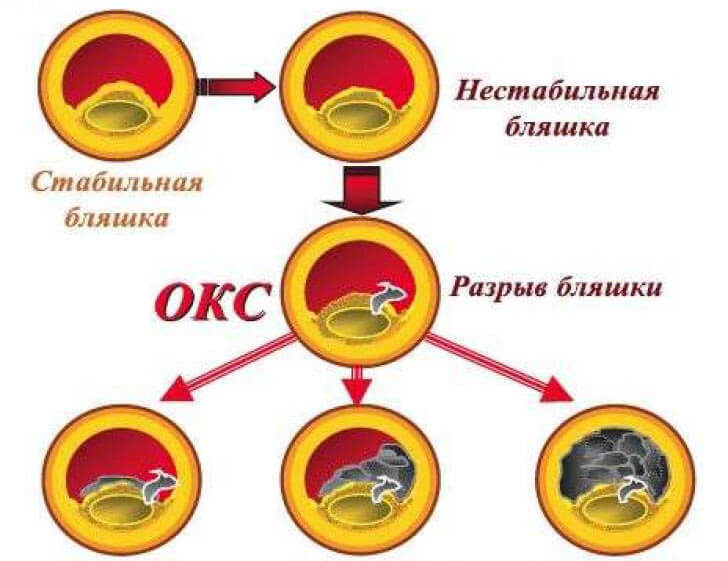 It plays an important role in the prevention of exacerbations, since it reduces the rate of atherosclerosis development, and with this the development of OCs. Permissible physical stress. Physical exercise is beneficial to the heart muscle, but only in moderate amounts. For example, after MI physical exercises are contraindicated, although there is a special rehab after the heart attack, and such moments should be clarified from the attending physician. Regular medical examinations. After an attack, an emergency or an MI should be timely observed by a doctor. Basically, at least once in half a year. If necessary, diagnostic tests are carried out. The bulk of folk medicine is made up of recipes aimed at combating IHD. They are most commonly used in the chronic course of the illness, or after the main course of treatment for ACS. Broth nettles. The collected tomatoes and dried leaves of nettles are brewed with boiling water at a rate of 100 ml per 1 st. After boiling on a small fire and cooling the broth take 50 ml to four times a day. The deconstruction of the blue lunar. Dried and crushed grass in the amount of 1 item. l pour a glass of boiling water and after boiling on a small fire for 5 minutes cooled down. Then take on a tablespoon up to 5 times a day. Infusion of gold thousand. A tablespoon of dry herbs pour two glasses of boiling water and insist for several hours in a dark place. Take the infusion three times a day in equal parts. Duration of the course - two weeks. Infusion of oat grains. One tablespoon of grains pour ten tablespoons of boiling water. Means to insist on the day and after taking 100 ml to 3 times a day. Accepted for painful sensations in the heart area for several days before the symptoms disappear. With unstable angina depends on the nature of the damage to the coronary arteries. If the narrowing occurred in the proximal departments, then the forecast is unfavorable. When distal arteries are damaged, a more favorable prognostic conclusion is made. Also important is the function of the left ventricle. With its insufficiency the forecast becomes more complicated. In the development of a myocardial infarction, an option with an uplift of the ST segment is considered less favorable than without it. Also important is the area of the affected myocardium: how much it occupies a large area, the heavier the patient's condition. Also, the prognostic conclusion is influenced by the age of the patient, the presence of bad habits, body weight, concomitant illnesses. In an unfavorable course, acute coronary syndrome may be complicated by cardiogenic shock or scarring of the affected area with repeated development of the MI.